Noah asked us almost daily when Liam was coming home. His way of asking was "Is Noah fixed yet? Is he big now?". 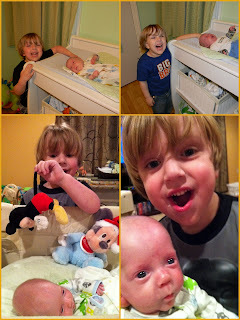 The days leading up to discharge we kept on talking up his role of being a big brother. Noah was so excited and had big ideas of Liam coming home. "Mommy, we need to sweep the floors because Liam will be crawling on them" Noah told me as I was cleaning up the house the night before discharge. I had to giggle and tell him that Liam won't be crawling yet or any time soon for that matter. It's funny what goes through his mind and what he thinks Liam will do. "Mommy, can we buy Liam some puffs? I loved puffs when I was a baby" Noah begged when we were at Target. I had to break the news that Liam won't be eating puffs when he comes home and that he can never feed Liam any sort of food (can you imagine what he would feed him? My first guess would be goldfish). Once Liam came home Noah was just over the moon wanting to kiss his face and hold his hands. Since we are germ freaks since our NICU stay we have a strict rule that he can only kiss the back of his head and play with Liam's feet. He is doing very well listening to our rules and kisses the back of Liam's head about 20 times a day. 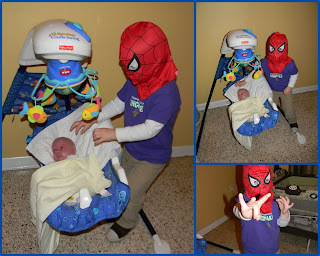 Yesterday Noah wanted to dress up as Spiderman. He thought it would be funny to try to scare Liam while he was in his swing. He was cracking up while he was "webbing" Liam. Isn't this what having a little brother all about? Tormenting them! I think this may be one of my favorite pictures thus far. Since we brought Liam home I feel like Noah has grown 10 inches and aged years. He is such a big boy and I love seeing him interact with Liam. I can't wait to see what type of mischief these two get into in the coming years.